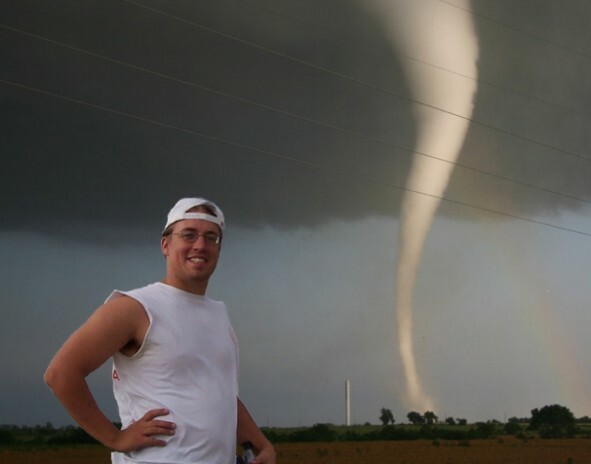 Reed Timmer is currently working on his PHD in Meteorology at the University of Oklahoma. Reed chases supercells, tornadoes, and hurricanes in his free time. Reed has a passion for weather that can only be described as "incredible"! Reed became an honorary member of Stormgasm.com in August of 2005. He has storm chased with Jim Bishop and Simon Brewer several times and finally became a member after an incredible Hurricane Katrina chase with Simon Brewer. Some of Reed's most memorable chases include: May 3,1999 F5 Moore, OK tornado, June 24,2003 F4 Manchester, SD tornado, Hurricane Floyd North Carolina Landfall in 1999, Hurricane Frances Florida Landfall in 2004, Hurricane Katrina Louisiana Landfall in 2005, and Hurricane Rita Landfall in 2005. Reed will most likely chase until he no longer has eye sight!